I went to college multiple times and taught some classes at more of them... and I'm still looking for Ivy College. I wanted to go to this place: a tiny college in the midwestern US, led by a president who cared for students personally and had the most collegial relationship with faculty. And... the president's wife, whom we know was the true brains behind the outfit, created the homey and generally sweet atmosphere for everyone, including the most irascible alumnus or donor. Then there's the romantic flashbacks to earlier times that are incredibly heartwarming and dripping with warm sugary syrup. Why was college a big deal in this 1950s series? because only about 7% of the US population got a college degree. That's about 1 in 14 people. Today, it's about 1 in 4. College was out of reach for many, so its appeal on a radio program, especially one that made college life seem so "perfect," would seem natural. It gave a glimpse of life few people at the time could experience themselves. But it was not to be... college ain't like this in the real world. But, we want it to be, with all of the over-the-top sentimentality, the puns and plays on words, and the crises that are all worked out in the end. And as for those plays on words and silly (but very endearing) dialogue, that's the influence of Don Quinn, who created this series after doing the same for Fibber McGee. He had worked with the Jordans from their Smackout days in 1931 and was a partner with them. It's one of those shows where you can tell that the entire cast is having a great time, and that they enjoyed working together. The Wikipedia page reminds us that some of the episode topics were quite bold at the time, though they may not seem so today. A couple of years ago, I got the OTRR set and I realized that I had run into better recordings in my past OTR endeavors. So I started to search again. Shadowsmom, a Cobaltian of great patience and diligence, went through all of the recordings and verified titles and sources. I had thought there would be many dupes of network, AFRS, and Voice of America recordings. Alas, the completist within me is unfulfilled -- there are no shows of multiple versions. We found some minor errors in the OTRR set, and have dealt with them accordingly. There are other circulating sets that have serious problems with file names. There are also some very bad sets in terms of sound quality. This set is the best collection we could assemble. There are some deficiencies, so we need the help of Cobaltia. Toward the end of the series, finding good recordings that were greater than 32kps proved to be a problem. There are others that need sound upgrades. So please, pull out your collections and hunt around for upgrades as we post. Shadowsmom will make a post soon about some of the episode name and other corrections. 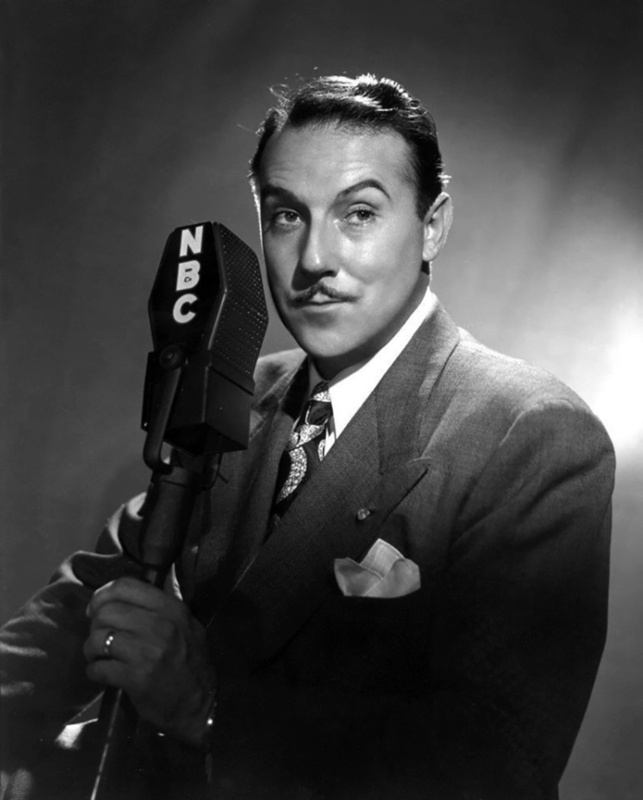 Gale Gordon was considered for the lead role -- which we find hard to believe in retrospect since we know the Colmans were so natural in the parts. But Gordon was a reliable actor, and it was understandable that he'd get a shot at a leading role, especially since Quinn knew of Gordon's talents first hand as Mayor LaTrivia. There are two audition recordings, the second being an abridged version of the first. So enjoy! Your participation would be greatly appreciated! This is from the Cumberland MD Evening Times of March 14, 1950 about the success of the series. The image is large, so if you are in Windows, right click on the image and select "view image" to see the rightmost text. (As an aside... the writer uses an opening that was popularized by legendary direct mail copywriter John Caples. It was he who wrote the most successful direct marketing ad that set the standard for copywriters for generations to come. It was for the sale of mail order piano lessons in 1926. The headline was "They laughed when I sat down at the piano... but when I started to play!" [You must be registered and logged in to see this link.] The formula is still used by copywriters today, and in this case, used by this news writer. It's funny to see how often the formula was used outside of advertising in the mid-20th century by people who never knew its origin). 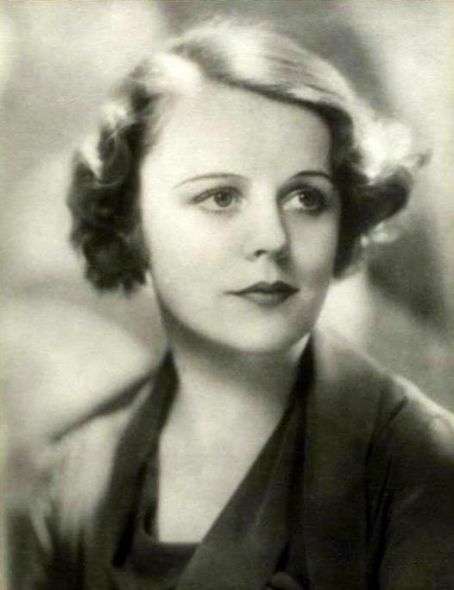 (right mouse click and choose "view image" to see the right hand side of the image). Airlanes -- THANKS SO VERY MUCH! I did not see it in the credits, but I did on IMDB.com -- late 50s and 1960s TV veteran Whit Bissell is in the show! I remember him most as Lt Gen Heywood Kirk from The Time Tunnel. Seeing Mary Wickes in the show was great, too. 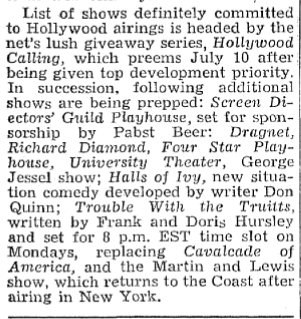 In the July 2, 1949 Billboard, the show was mentioned as being ready for the Fall season. But what is that show "Trouble with the Truitts"? are any of those around? 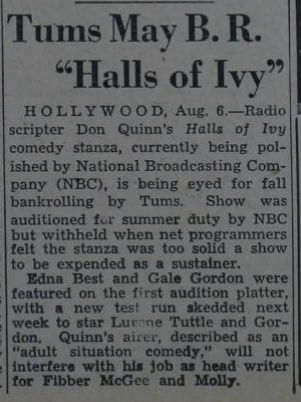 Then on August 13 of the same year, Billboard reports that Halls of Ivy is about all set to go with Gale Gordon and a "B.R." (Billboardese for "bankroller" or sponsor)... TUMS! As I've been going through whatever clippings I could find, I think the show was getting everyone ready for a Fall premiere, and suddenly the Colmans became available for the show. 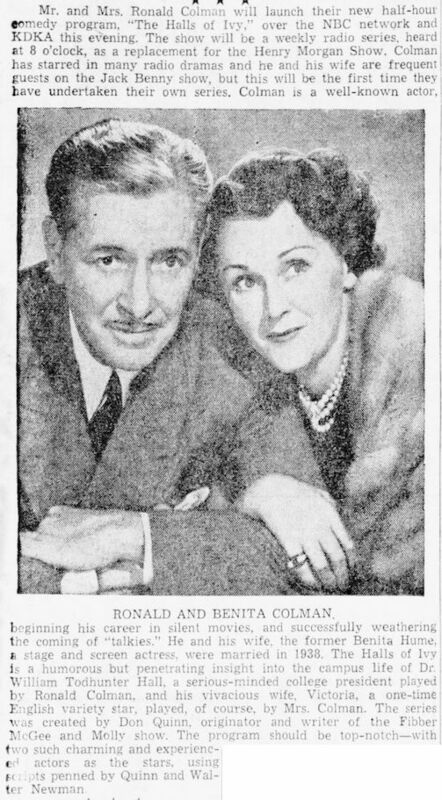 As far as appearances on the Jack Benny show being the reason for seeking them, the Colmans were on the show many times starting in the mid-1940s. 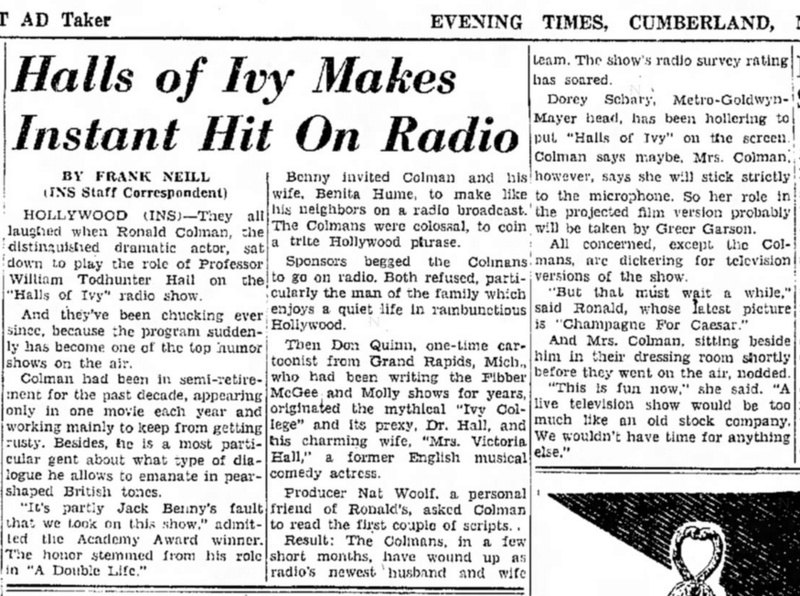 Their last appearance in the Benny show prior to the Halls of Ivy was in November 1949. There are Billboard references as early as September 1949 that the show would feature the Colmans. So it seems something happened in August 1949 to change the plans for the show cast. 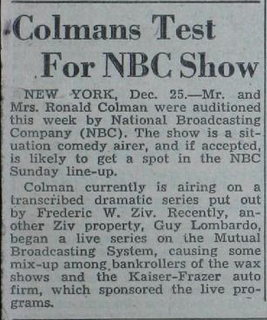 It turns out that the Colmans had auditioned for an unidentified sitcom for NBC in December 1948. Perhaps NBC came to like the Halls of Ivy idea better than the one they originally had in mind. The following clip is from Billboard of January 1, 1949 about the December 1948 test. This also explains why there was a show premiere in January 1950 and not in Fall 1949. The dynamics of sponsorship changed considerably with a high profile Hollywood couple and the price of sponsorship went up and there was a demand by the producers for a much better time slot. There was even a chance that the show would be on CBS! Those clips will be posted later. The producers, sponsors, and the networks knew they had a potential hit on their hands and they kept waiting for others to blink as they negotiated with each other. 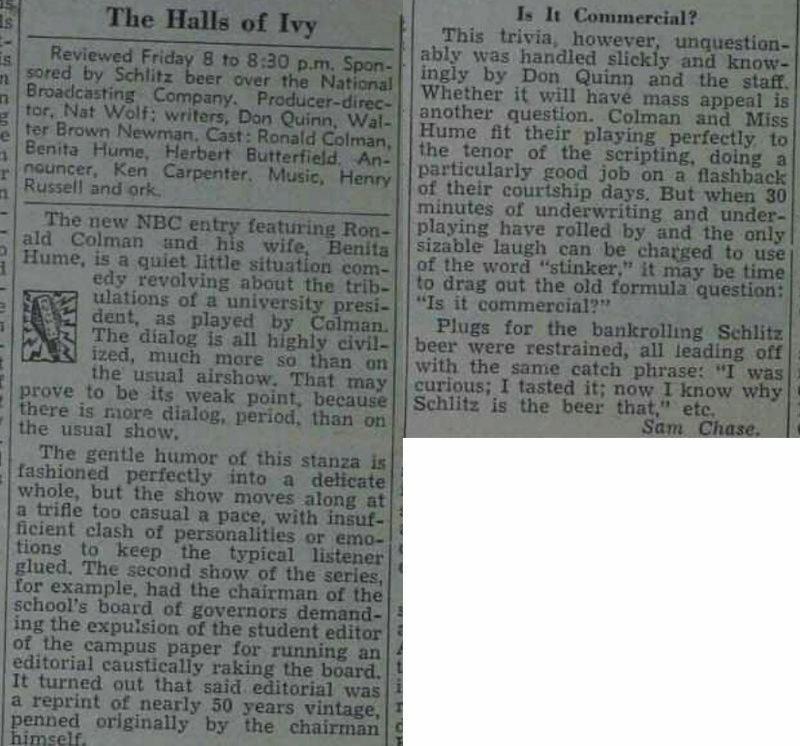 It's also pretty clear that Halls of Ivy did become a hot property in its early weeks of broadcasting, stimulating a desire for a quick entry into TV. There was even a script prepared for a Broadway play! Strangely, tax laws played a role in the desire of the Colmans to do all of these things. They felt it was not worth the effort for extra dollars when the taxman would be taking 90% of those incremental earnings. Colman had semi-retired, and you get the sense he was enjoying that life and also enjoying playing hard to get. Colman was 59 when the radio show started, with Benita Hume 15 years his junior. The Colmans loved the show and the concept, but were cautious about being devoured by it. By the time the show was in its final year, TV was where all the advertising dollars were going. The Colmans did not seek complexities of TV stage productions and preferred the much easier coming into a studio and standing around microphones for a few hours among friends. This is the likely explanation of why it took so long to get to television, and why only one season of shows were produced. They may have delayed so long that the Halls of Ivy franchise had started to run out of gas. Colman died in 1958 at age 67, of emphysema, a disease which may have affected his stamina on the set in his later career, and therefore his lack of desire to commit to big projects in his early 60s. This show has proved to have a more interesting background that I had ever considered! Thank you very much for these. I have been waiting to get the definitive set of Halls of Ivy to listen too. Thanks greybelt for continuing to improve our collections! Thank you Shadowsmom for making this happen. Tom In Ohio, I hope you are enjoying these shows as much as I have enjoyed them.